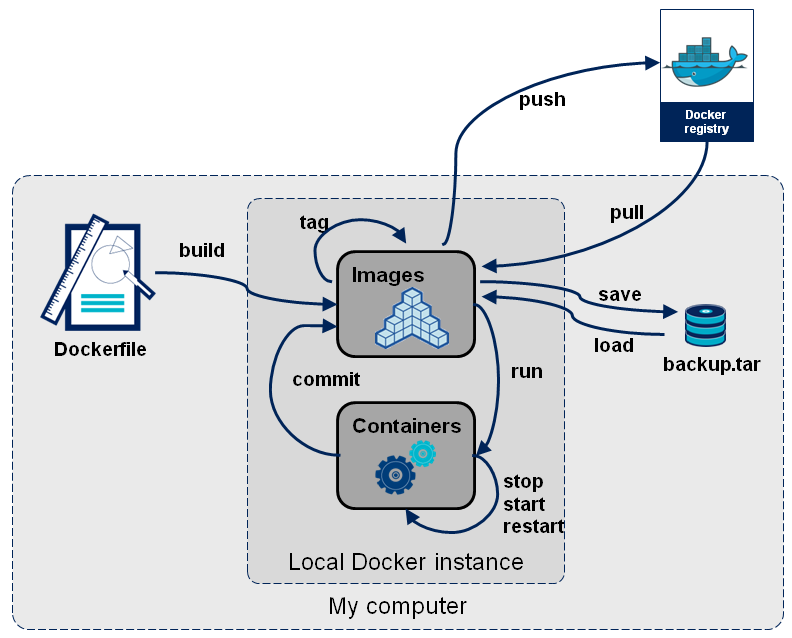 docker inspect <CONTAINER_ID> | grep -C3 -e "Volumes\":"
docker build -t docker.onestch.com:5000/admin/registry:0.1 . You need autoconf version 2.59 or newer installed. Update them from Software Update in the App Store. In order to prevent conflicts with Apple''s own libtool we have prepended a "g"
You can run ./configure now. Apache 2.x. See the INSTALL file for details. compiler than the one used to compile Apache. This could cause some problems. possibilities of shapes and symbols that can be rendered. speech), since it is released under the GPL license. BUT WHY? Does this thing have any real use? could help them make good-looking diagrams easily/quickly. much easier. ditaa syntax can currently be embedded to HTML. The latest version of ditaa can be obtained from its SourceForge project page. You can also browse the code online. anti-aliasing can be achieved using Java 1.5 or higher. -e,--encoding <ENCODING>   The encoding of the input file. produced with the appropriate <img> tags. already exists, an alternative name is chosen. -S,--no-shadows            Turns off the drop-shadow effect. -v,--verbose               Makes ditaa more verbose. to white (from the default black). shapes, and they have no effect anywhere outside. database or a hard disk. 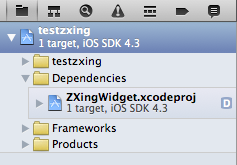 After an upgrading to Xcode 4, I have been having trouble compiling my own ZXing iOS project. 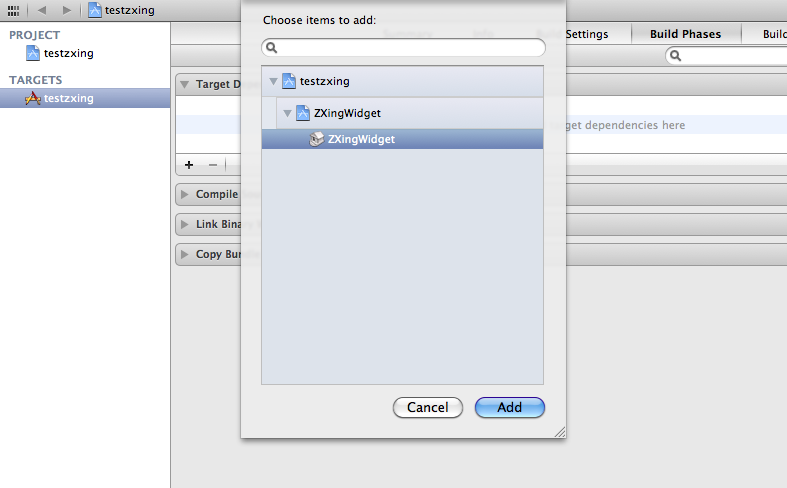 That’s why I decided to explain you how to install easily ZXing with Xcode 4. First of all (for those who don’t know), ZXing is an open-source library to read the 1D/2D barcodes. This library is available on many platforms such as the iOS, Android, Blackberry, ect. You can find it here: http://code.google.com/p/zxing/. Before to start, be sure that you have the latest version of ZXing on your computer. If you don’t, you must download it via a SVN client here: http://zxing.googlecode.com/svn/trunk/. Firstly go to the “zxing/iphone/ZXingWidget/” and drag and drop the ZXingWidget.xcodeproj file onto your Xcode “Project navigator” sidebar. If a dialog appears uncheck the “Copy items” and verify that the “Reference Type” is “Relative to Project” before clicking “Add”. First select your project file in the “Project navigator”. Then select the corresponding target. After choose the “Build Phases” tab and expand the “Target Dependencies” section. Click the “+” (add) button to display a dialog. To finish add the “ZXingWidget” target as shown above. 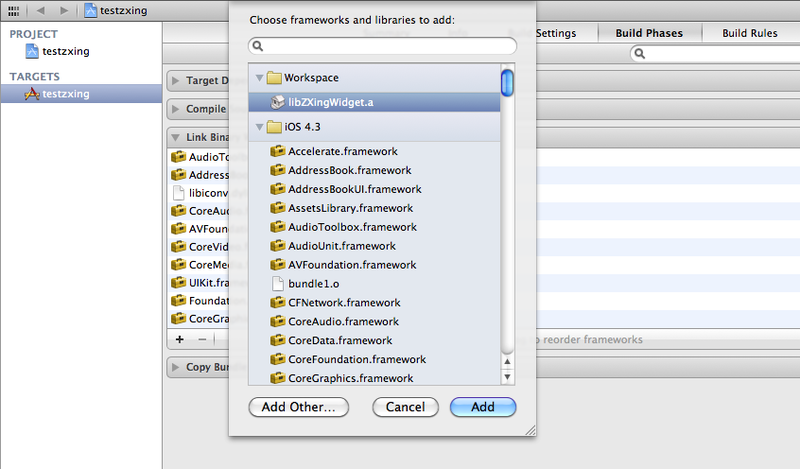 Firstly choose the “Build Phases” tab and expand the “Link Binary With Libraries” section. Then click the “+” (add) button to display a dialog. To finish add the “libZXingWidget.a” which is located in the “Workspace” category as shown above. In the “Project navigator” select the main project (not the target). Go to the “Build Settings” tab and search the “Header Search Paths“. The full path of the “zxing/iphone/ZXingWidget/Classes” directory. Check the “recursive path“. The full path of the “zxing/cpp/core/src/” directory. Uncheck the “recursive path“. Now you just have to import the “ZXingWidgetController.h” and the “QRCodeReader.h” to your project and use them. Attention: Make sure that the files in which you are using the ZXing headers have the .mm extension because they use c++ library files. Voilà! Now all should be ok. I hope it’ll help you! git config --global user.name "your.name"
Hi your.name! You've successfully authenticated, but GitHub does not provide shell access.